Many organizations are considering swapping out some of their Hard Disk Drives (HDD) for Solid State Drives (SSD) to increase I/O throughput and power density (IOPS/Watt). But how do you compare cost vs. performance to determine the best technology mix for specific application environments? The Storage Networking Industry Association (SNIA) has completed an in-depth analysis of the factors that need to be considered in comparing HDDs and SSDs for any given application. It concluded that assessing Total Cost of Ownership offered the most realistic basis for comparison - assessing both the direct and indirect cost of deploying a storage system over its life cycle. * Acquisition. Analysis of acquisition costs needs to include cost per drive, software licenses and differing architecture options. Consider that, in a high random I/O transaction application (i.e. Exchange email, banking transactions, etc. ), a single SSD could replace an array of 10 or more HDDs, resulting in a smaller footprint, higher performance and lower costs for supporting hardware and software licensing. * Maintenance and Repair. HDDs have an annual failure rate of 2% to 8%. So as many as one in 12 HDDs deployed will fail every year. Factor in the cost of a drive, the personnel to replace it and any system downtime to get a clear picture of the true cost of these replacements. In addition, SSDs need to be treated as a consumable with endurance dependent on multiple factors, which vary by manufacturer and design. * Power and Cooling. In tier 0 and 1 storage systems, choosing SSDs can save more than 80% in total storage system energy requirements. There are many elements to this calculation. Ultimately, it is the greater power density (IOPS/Watt) of SSDs that make the difference; fewer drives can deliver the same throughput for less power, with the added benefit of requiring less space and cooling. * RAID Configuration. It is standard practice to use RAID configurations to improve performance and reliability. Conventional RAID configurations mask the high I/O latency inherent in HDDs. New SSD-friendly RAID implementations both exploit and enhance the performance and reliability of SSDs. The tradeoffs between levels of RAID can significantly shift the performance, cost and reliability equations so the relative benefits need to be factored into a complete TCO exercise. The SNIA provides a TCO calculation spreadsheet in Microsoft Excel format for download which incorporates all of these factors. Calculating a full TCO is an important discipline. But for immediate comparison between SSD types and designs, some simple metrics are useful. 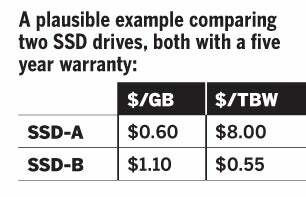 In the HDD era, the rule of thumb measures were cost per GB and I/O throughput. The characteristics of SSDs weaken the relevance of cost per GB and mean that tests of I/O throughput need to be appropriate to SSDs to ensure accurate real-world performance comparisons can be made between drive types. This leads to two new rules. One, adopt cost per terabyte written ($/TBW) as a key metric for comparison. And two, compare performance on the basis of standardized tests, suited to SSDs. Why do you need the $/TBW figure? The various NAND technologies used to create SSDs all have finite lives. The logic gates degrade after a certain number of writes, after which they can no longer reliably store data. The critical factor is that the warranty always incorporates a limit on the number of writes in that warranty period. The impact of this is significant, and clarity about its impact is essential when making a purchasing decision. The management of NAND flash memory devices within an SSD to optimize the drive's overall performance is complex. The effectiveness of flash management, leading to the drive's measured performance, is affected by several factors: the state of the drive prior to the test, the workload pattern (such as the read/write mix and block size being written) and the data pattern. SNIA has evaluated the impact of these different factors and developed a performance test specification for enterprise solid state storage. Realistic comparisons between HDDs and the best performing SSDs show that for the majority of enterprise applications the performance benefits of SSDs are now available at a price that is becoming competitive with HDDs. Think TCO and ask for $/TBW and SNIA performance figures. Then simply run the numbers; they speak for themselves. This TCO calculation example provided by SNIA is based on a random write intensive Microsoft Exchange email application designed for 2,000 heavy BlackBerry users. The TCO results indicate that a SSD is a better choice than a HDD for this application. When using the above data, the SNIA SSS TCO Calculator recommends the user to replace the 18 HDDs with two SSDs in this Microsoft Exchange Email Server example. SMART Storage Systems is a technology leader in the design, development and deployment of current and next-generation enterprise solid-state storage products. Combining leading-edge, enterprise-class design and proven world-class support, SMART Storage Systems leverages its deep expertise in Flash and enterprise storage technology. SMART Storage Systems is part of the SMART family of global companies.